Many people have been asking for the wonderful pattern that the crafter going by the name of "Raspberry Hamentashen" designed on the web. The page for this lesson was no longer available. I contacted the designer and offered to host this pattern. This is designed to be used as an Girl Scout Swap pin. The pins you wear that are made using safety pins and small seed beads. The same pattern could also be used with pony beads and ribbon or gymp and woven into a large beadie. With permission of ©Raspberry Hamentashen who holds all copyrights. May be printed for use at home or classroom with copyright acknowledged. See Eileen's (Chadis Crafts' Fun Pages) Scouting PAGE, for links to other swap pins used by Girl Scouts and Others. 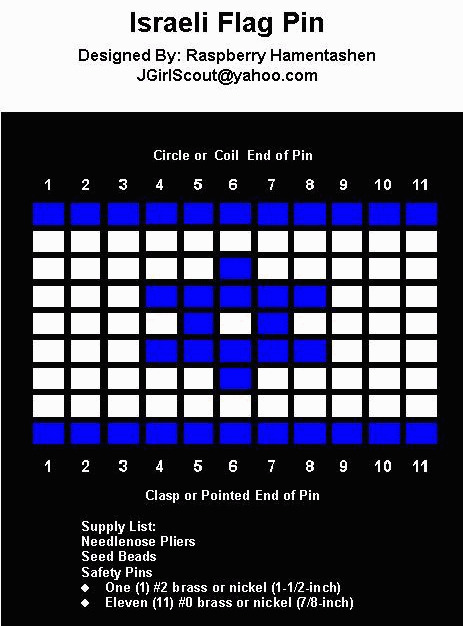 Instructions to use as pony bead pattern. Same count of beads as above but use mini or regular size pony beads. Curling Ribbon or Gymp about 3 feet. Weave as other beadie patterns. see Eileen's Beadie Page for instructions on how to make beadies.